New innovations have made it more of an all-rounder, and this UST tubeless disc-brake version of the wheelset delivers incredible all-around performance at a light weight (1650g) and a price that can't be beat. Engineered with Mavic UST technology, the Cosmic Pro Carbon UST Disc offers all the benefits of tubeless, including less rolling resistance, a smoother ride quality and a reduced risk of flats. The 45mm deep rims are NACA compliant for low drag and excellent crosswind stability, and their lighter weight results in reduced inertia for explosive acceleration and climbing efficiency. 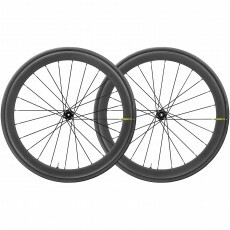 The wheels are engineered specifically for disc brakes, with an optimized spoke count and lacing. It is built on the Instant Drive 360 freehub, which offers fast freewheel engagement and compatibility with any kind of frame. The Cosmic Pro Carbon UST is completed with 25mm Yksion Pro UST tires for maximum rolling efficiency, grip and a smooth, comfortable ride. The Yksion Pro UST tires complement perfectly the aerodynamic qualities of the wheels by featuring a 127 TPI casing and a light weight of just 260 grams (25 mm version). The front wheel is compatible with 12x100 mm thru axles and can be converted to 9x100mm quick release (adapters included). The rear wheel is suited for 12x142mm thru axles but can be also converted to 10x135mm quick release (adapter included). Compatible with Centerlock brake discs.